The world has thankfully become much more proactive over the past decade in the quest to maintain the earth for future generations. The playground industry is no different, making great strides forward to ensure that the carbon footprint of playgrounds is kept to a minimum creating play areas for our children, avoiding adverse effects on our environment by using up valuable resources. For example, the materials used to construct playgrounds have incorporated recycled steel and aluminium, which thankfully doesn’t have any negative impact on the equipment’s strength, as the metal’s integral physical properties still remain the same when recycled. The use of ethically harvested wood is also now commonplace, meaning that wood is bought using trees that are replaced once they have been chopped down for sale. The safety surfacing for playgrounds has also seen vast improvements. Rubber tiles are easy to reuse if they ever need to be replaced, and the likes of synthetic turf, grass mats, and wood fibre surfacing all mean that playgrounds are now filled with superb sustainable materials. Again, these low-maintenance products don’t come close to demonstrating any downturn in quality, and if anything are much more effective at preventing injuries due to the cushioning properties that these superb modern day products have, gained from years of experience within the industry. For example, our EcoSmart grass mats are made from recycled rubber, so they’re not only eco-friendly – but the use of rubber provides a much softer material to land on than the plastic finish of other grass mats. Furthermore, the product can be used on grass, hills and embankments, which has real grass growing underneath, bringing children much closer to the texture and smells of nature. Playgrounds constructed from recycled components mean that safe play environments are now created to last for generations, preventing the need for refurbishments after just a few years. But the use of eco-friendly materials, along with parents teaching their children about the importance of treating equipment with care and respect, will result in safe play areas that will provide fun and exploration without the need to waste any resources. 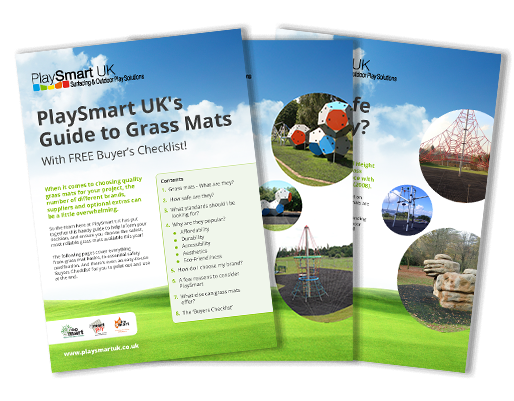 For more information on rubber grass mats, why not take a look at our free industry guide? To download, please click on the image below.